Why did you choose Point Park’s Ph.D. in Community Engagement Program? Point Park's Ph.D. in Community Engagement is an interdisciplinary program that focuses on servant leadership, social justice and community. As a doctoral student, I am able to add to the body of knowledge by creating engaged scholarship. I had an amazing experience during my undergraduate studies and I couldn't wait to return to campus to complete my doctorate degree. You are the driving force behind Point Park’s new Pioneer Pantry. Tell us what led you to this idea and how you brought it to fruition? On the first day of the Ph.D. program, the cohort volunteered with the Greater Pittsburgh Community Food Bank and it inspired our research on food insecurity in Southwestern Pennsylvania. While visiting the University of Nebraska at Omaha, I saw their food pantry and thought that Point Park may need one too. With the support of faculty and administration, I was able to send out a survey and determine that a food pantry was needed on campus. What is Pioneer Pantry and who does it serve? 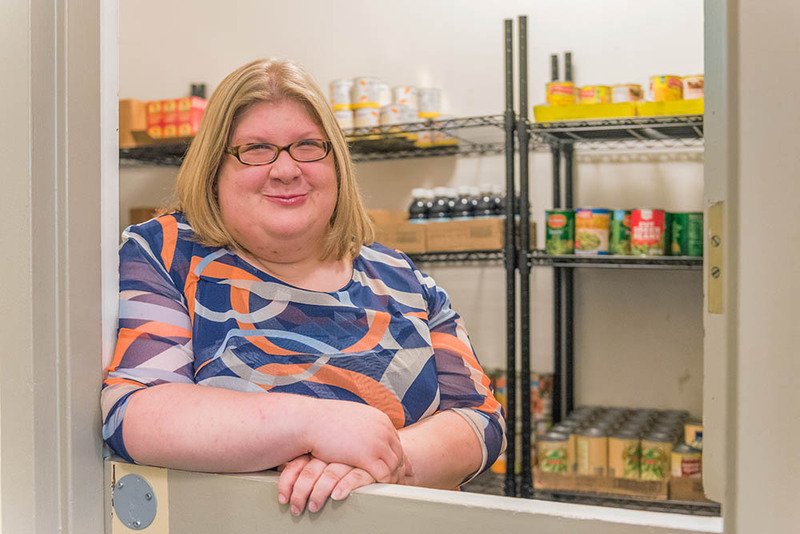 Pioneer Pantry strives to alleviate food insecurity by providing supplemental food free to those in need within the Point Park University community. We work to change the perception of hunger on campus and provide resources to educate the community about nutrition and healthy eating. Students currently enrolled at Point Park University are eligible to receive up to 10 items twice a month by filling out the order form at pioneerpantry.org. What have been some of the most rewarding experiences for you now that Pioneer Pantry is open? The Point Park University community has come together to support students who are hungry and being able to organize that is truly rewarding. The Pioneer Pantry has filled more than 60 orders with support of students, faculty, staff and administration. I am so proud and thankful that I have been able to be a part of this project. What have you enjoyed most as a Ph.D. student? I have enjoyed working on innovative projects like the Pioneer Pantry. I have had the opportunity to work with local nonprofits to support their efforts to better the community by conducting program evaluations and communication plans. I would like to be a professor at an institution of higher education. At the same time, I would like to continue to build and support community programs. Visit pioneerpantry.org to find out more about organizing a food drive, volunteering at the pantry or placing a food order.